Doing What He Loves Most! This is Oliver. He is our 6 month old Wire hair Jack Russell Terrier Mix and is full of energy! If it were up to him he would play from sun up 'til sun down. Our Ollie loves to go to the park and chase the frisbee! He gets along with every dog he meets. He is a very intelligent pup and has learned a lot of fun tricks. Everyone we meet loves to come up and make friends with him. He is extremely adorable and lovable. When Oliver's energy is spent, he turns into the world's biggest cuddle-bug! My fiance and I could not imagine having any other puppy. Oliver was meant to be our dog, and we love everything about him! 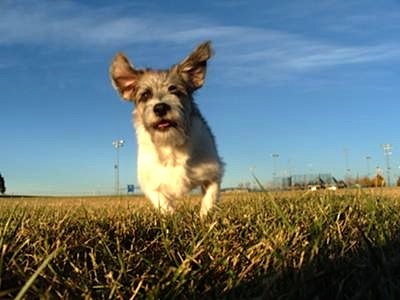 What a fun picture of your Jack Russell Terrier! Oh he is sooooo cute! Onaliaha loves him very much. You're a lucky girl Brenda! Your dog is so cute. Jack Russell Terriers are very energetic dogs, especially if you let them play with you. They like to hang on your lab's neck and ride on their back and sometimes they even like to hide under your table and hide their own toys down there. They are very cuddly when their energy is spent, and what I like about Jack Russell's the most is the look on their face when they are trying to figure out what in the world you are doing. I wish your Ollie would visit me someday. He really look cute in your page and I wish I can play with him more often. Thanks for sharing.